Whether you were a member of one of our first-year LLCs or are just looking for the added benefits of living in an LLC as an upperclass student, our communities offer the chance to bond with your peers through specialized programs and events. In addition, upperclass LLCs provide unique experiences to connect with faculty, staff, and community leaders, giving you access to research and internship opportunities to prepare you for your future career! Explore the individual LLC pages to learn more about each community, the corresponding requirements, and the programs and events you can expect during your time in the LLC. Check out the information below to find out how to apply or connect with Panther Central for general housing application questions. In partnership with the Swanson School of Engineering, Residence Life provides upper-class Engineering students with the opportunity to join a community of fellow scholars with shared academic passions and career goals. Students selected for this LLC reside in Panther Hall, an upperclass suite-style residence hall. Upperclass Engineering students serve as Resident Assistants who offer guidance, implement events, and foster a supportive and inclusive residential community. In addition to social programming offered to all residential students, LLC members participate in activities and events designed to prepare students academically for success in both the engineering field and graduate level studies. Engage in established study groups with fellow LLC members. Discover co-op and internship opportunities available to Engineering students. Form life-long relationships with fellow Engineering students. Explore graduate school opportunities and preparation activities. Prepare for co-op, internship, and job interviews and networking events. Establish meaningful relationships with Engineering faculty, professionals, and staff. Mentor first-year Engineering LLC students. The Health Sciences Living Learning Community (LLC), in partnership with the School of Health Sciences, is available to all upperclass students planning a career in medicine or another health sciences field. Students who live in this community will be provided with enhanced opportunities to make them more competitive in their future medical careers, graduate school applications and medical school applications. Attend training presentations related to their medical fields of interest. Have access to academic resources that can assist them with their science-related course work. Learn about medical school opportunities and participate in MCAT test preparation programs. Learn about possible medical research programs and opportunities. Did you complete Emerging Leaders or participate in the Emerging Leaders LLC? 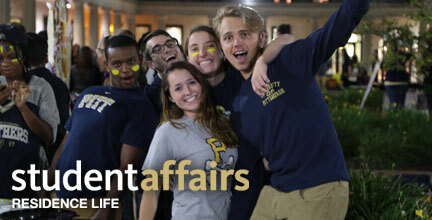 Then the Leadership in Action LLC should be the next step in your Pitt leadership journey. The Leadership in Action LLC is a direct partnership with the Leadership in Action program in the Office of Cross Cultural and Leadership Development (CCLD). The format of Leadership in Action, as well as the LLC, is that of an interactive case study. As a student participant, you will work alongside our community partners to solve a real organizational issue in a group setting. Together, you’ll generate appropriate recommendations for the organization. Similar to the cohort-based model of the Emerging Leaders LLC, where LLC students take the Emerging Leaders course together, Leadership in Action LLC students will be grouped for their Leadership in Action case study. As a group, the LLC students will complete an initial planning meeting with their agency after which your Leadership in Action LLC team will work on implementing a solution to the problem facing your assigned organization. Throughout this process you will have the opportunity to learn and practice the five new leadership techniques emphasized in the program. Finally, your case study will require your team to apply creative thinking and problem-solving techniques. The Leadership in Action LLC is a beneficial program for both student participants and community agencies. Develop your leadership skills while helping to provide our community partners with a fresh student perspective. Gain hands-on experience by going into the community and working on real-life issues in a team setting. Projects vary each year, but could range from organizing a fundraiser, planning an event, developing a public outreach strategy, developing a new program, devising a marketing plan, engaging in a mentoring program, etc. Take your leadership skills to the next level as a part of the Leadership in Action LLC! In partnership with the Office of Cross Cultural & Leadership Development, Residence Life provides upperclass students with the opportunity to live in an intentional community of people with diverse identities and backgrounds who share an interest in cultural understanding and social justice. Students selected for this LLC reside in Panther Hall, an upperclass suite-style residence hall. An upperclass student serves as a Resident Assistant who offers guidance, implements events, and fosters a supportive and inclusive residential community. In addition to social programming offered to all residential students, Multicultural LLC members participate in activities and events designed to promote cultural awareness, appreciation, and action. Explore various components of personal identity, including: socio-economic status, age, race, gender, sexual orientation, religious beliefs, and physical ability. Examine the impact of social justice leaders and movements on current events. Discover the traditions and norms of other cultures. The Pitt Business Global Leadership Living Learning Community (LLC), in partnership with the College of Business Administration offers students the opportunity to expand on the art of leadership in a global context. LLC members will be exposed to local experts and study abroad opportunities to expand their global awareness within leadership. One of the hallmarks of outstanding leaders is an awareness of the challenges faced by society and our local communities. Many future employers, as well as many graduate and professional schools, are looking for individuals who have contributed in a meaningful way to their community and who have applied their academic knowledge through service. Service learning guides the Upperclass Service to Others Living Learning Community (LLC) experience in partnership with Pitt's School of Social Work. The knowledge and skills gained from academic coursework and co-curricular activities enable students to actively engage in positive community change. Students residing in the Service to Others LLC enroll in a three (3) credit Introduction to Social Work seminar course over their two (2) semesters in residence (students can take this course as variable 1-3 credits each term over two terms for a total of 3 credits, and this course will then count toward a Social Work degree or minor, should they wish to pursue further pre-professional study in Social Work.). This seminar course has generally met on Thursdays from 5:30 – 6:30 p.m. in Panther Hall. Network with knowledgeable nonprofit, social service, business, government, and community leaders to develop and refine leadership skills. Connect with fellow students interested in social justice and community service in a structured service learning community that also allows exploration of skills and careers in Social Work and related helping professions. Residents who are interested will have enhanced opportunities to complete an undergraduate degree or minor in Social Work and apply to the graduate programs in Social Work (MSW and PhD).